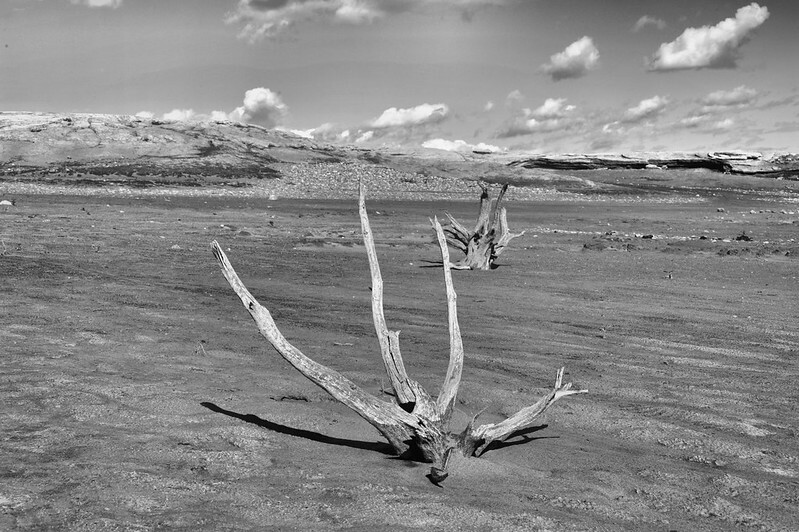 Here’s another image I shot this week on the dry lake bed at Elephant Butte Lake State Park near Truth or Consequences, New Mexico. The exposed gray branches, lit by the midday sun, contrast nicely with the dark brown sand and work really well for black and white processing. Click on the photo to view larger on my Flickr site. Feels good to be exploring the world with my Nikon 700 again. This was minimally processed in Paint Shop Pro X9. I’m planning to post here every Monday, Wednesday and Friday for as long as I’m inspired to do so. You can also see my earlier stuff on my Flickr page. I’m a big fan of the Topaz Labs family of filters and plug-ins. I’ve been using them for several years now, and Topaz continues to improve both the functionality of the product as well as the user-friendliness of the interface. Another thing that I like about Topaz is that they offer free, live webinars where they demonstrate how to use their products to achieve specific results. The webinars are offered about twice a week–usually there’s a one-hour version on Tuesdays, and then there’s a “Quick Tip Thursday” edition that addresses a more specific task. The webinars are recorded and made available for free on YouTube afterwards. 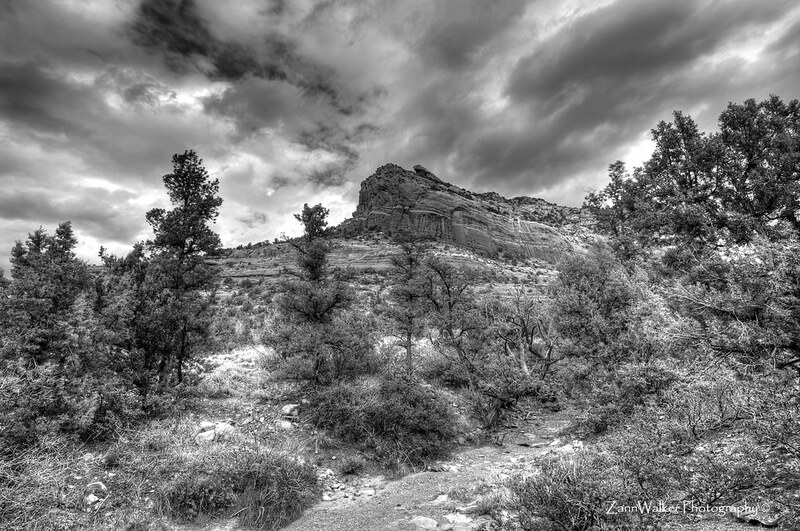 Today’s Quick Tip Thursday edition dealt with using the Topaz Black & White Effects plug-in to add drama to skies and clouds, without darkening up the rest of the photo. The process uses the selective color sliders in the plug-in to darken up the blues and cyans, while leaving the other colors alone. This technique works great on images where there isn’t any other blue in the shot. After watching the demonstration, I pulled out an old photo from February 2011 that I shot at South Mountain in Phoenix, Arizona. This image was shot with the Nikon D700, using my 14-28mm Nikkor glass (love that lens!!). I had never processed this particular image, but thought it would be fun to use for this technique. The first thing I did was open the image in Lightroom and adjusted the exposure just slightly, and added a touch of clarity. I think I probably overdid the sky just a little bit, but I was trying to push it to see how the technique worked. Overall, I like the results, though, especially since the foreground did not get darkened when the sky did. I do like the drama of the image, and how it highlights the feathering in the clouds! This is something I look forward to practicing more in the future! Tonight I decided to pull out some old brackets and do some HDR processing, using the new Topaz Adjust and Topaz Black & White Effects plug-ins that I’ve recently acquired. I found this set of brackets that I shot from the top of South Mountain Park in Phoenix, on a partly-cloudy afternoon just after a storm front had moved through. 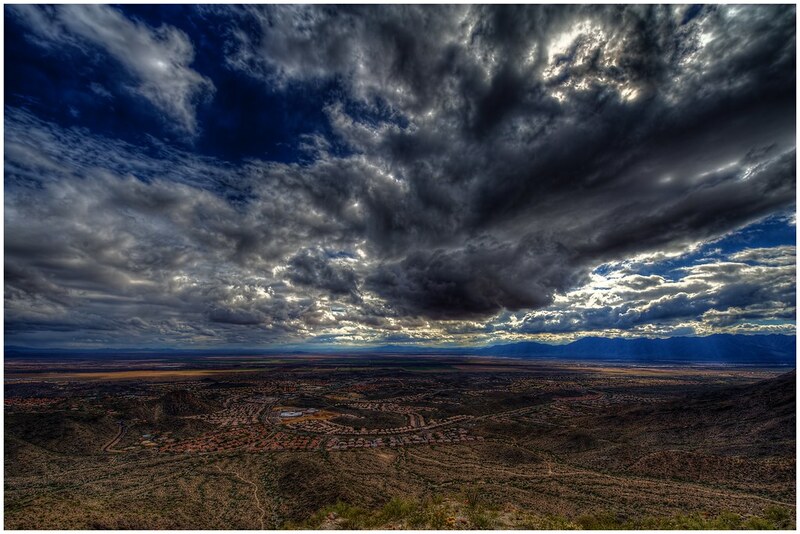 From the top of South Mountain, there was a clear view of the suburb of Ahwatukee, and the remaining clouds were still dramatic enough to really lend a sense of scale to the landscape. 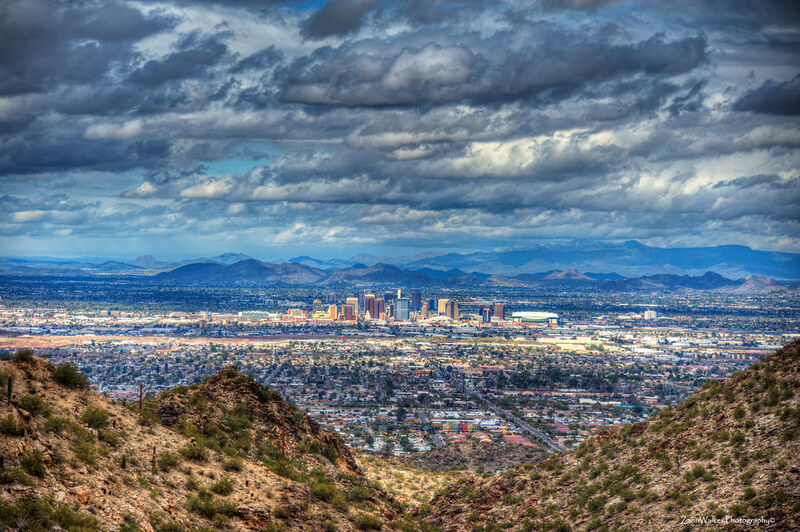 From the to of South Mountain, you can almost see forever! I shot these brackets with my 14-24mm Nikkor wide-angle lens, using my Nikon D700 camera mounted on a tripod. I processed the brackets in Photomatix 4, then edited the resulting TIFF in Paintshop Photo Pro X4. First I used Topaz Adjust to correct exposure and bump up the clarity slightly. I then added a layer using Topaz Black & White Effects, using the low-key preset which I adjusted slightly to add some detail. I lowered the opacity of this layer, as I just wanted to add a little drama to the clouds, especially where the sun was filtering through. Today, we closed on the sale of our home in Arizona, so we no longer have any real estate ties to the Phoenix area. I guess this image is a little bit of nostalgia for a place that I really did enjoy living and photographing. I’ll still be returning there several times a year for work, so hopefully this won’t be the last time I see such a magnificent landscape as this through my viewfinder. For those of you who may not know it yet, my hubby Andy and I are preparing to take our leave from Arizona. We will be moving 1600 miles east to Tupelo, Mississippi, within the next three to four weeks. This is a “going home” move for me, a chance to live closer to my parents as well as my four brothers, their wives and all my nieces and nephews. For the past few months, we have spent the evenings and weekends on home improvement projects to get our house ready to put on the rental market (the prices are just too depressed to try and sell it right now). We already have a contract on a house in Tupelo that should close within the next few weeks, so we’re starting the process of packing and decluttering in preparation for the big move. With all these life changes, I haven’t concentrated too much on my photography for the past few months. But as the time draws closer to leave Arizona, I’m already missing some of the places where I’ve spent quality time with the Nikons. 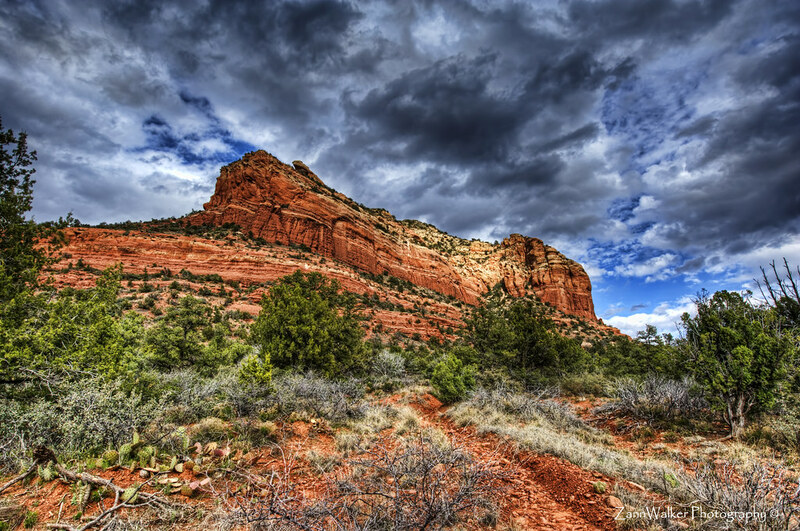 And there’s no place like Sedona when it comes to pure scenic spendor. Tonight I went through some of my files from our trip to Sedona back in March, and I found some shots that I still hadn’t processed. I couldn’t resist running a few brackets through Photomatix to produce this HDR of Lizard Head Rock, but this time I decided to go with the black-and-white version. I love the red rocks of Sedona, but for this shot I wanted to allow the eye more of an opportunity to see the shape and texture of the rocks, rather than the color. Look at the top of the mountain, and you’ll see how it got its name. I’m looking forward to getting moved out to Tupelo just in time for the beautiful fall colors to reach their peak in October. There are beautiful landscapes, distinctive Southern architecture, and amazing people just waiting to be photographed, and I can’t wait to expand my portfolio in a totally new direction. Stay tuned to see where the Zen takes us! We spent the weekend in Sedona, one of my all-time favorite places to be in the entire world. Call it a cliche, but there’s just something magical about the landscape around Sedona, the way the sun lights up the red rocks at certain times of the day, and especially when there are dark clouds in the background. On Saturday, the skies were mostly cloudy, making it difficult to get shots of the red rocks with that “glow”. It was also very windy, so any bracketed shots were sure to have ghosting issues from the movement of the tree branches. I’ve just begun processing last weekend’s images, so I’m still not sure what all I came away with. Regardless, it was a fun weekend, doing some light hiking and lots of photography. We enjoyed our stay at Los Abrigados (although I’m still a little irritated that they didn’t provide the usual travel-size toiletries that most places do–they expect you to buy them in their gift shop or salon). Stay tuned for more images from Sedona over the next week or so! 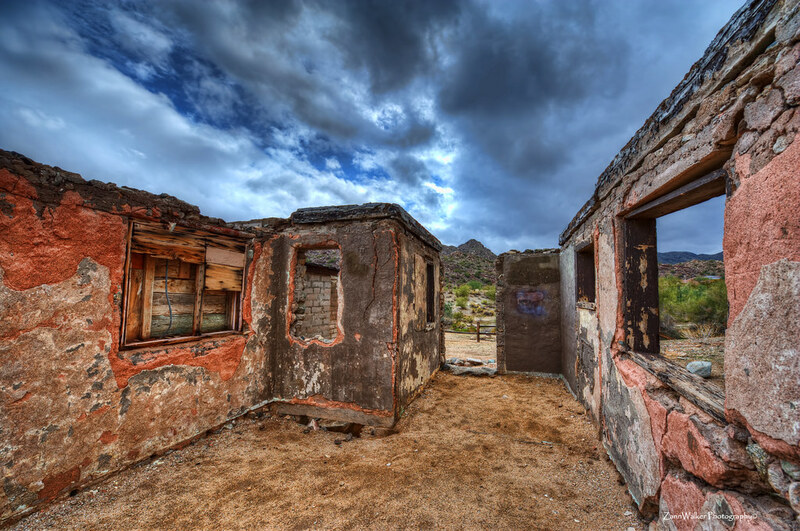 Many, if not most, of the structures in Jerome have been abandoned at one time or another, but they have been reoccupied by artists and gallery owners, as well as restaurant owners, bed-and-breakfast operators and souvenir hawkers. While strolling around Jerome we came across the studio of a glass-blower which occupies a once-abandoned building. 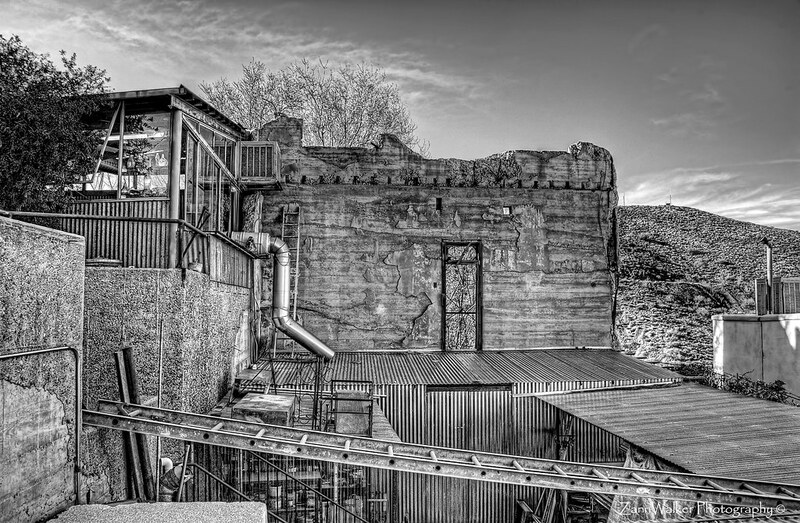 I used a set of three brackets to produce this black-and-white HDR image. 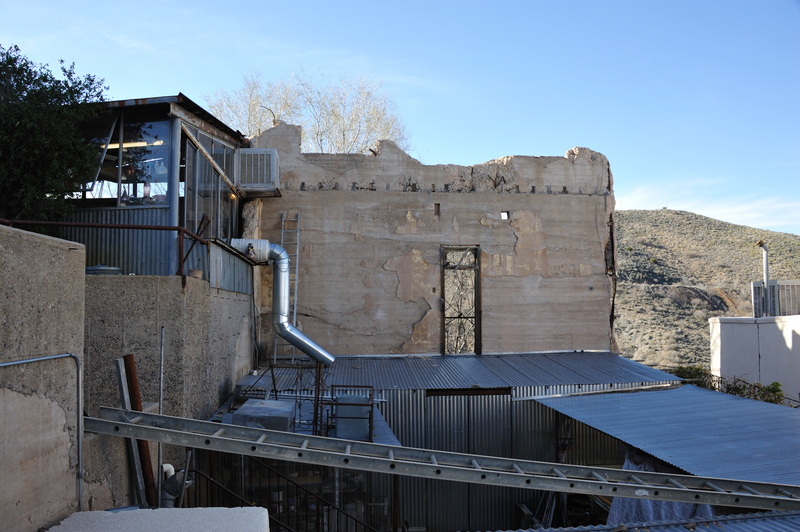 At the upper left you can see the windows of the glass-blower’s studio–he has a beautiful view of the Verde Valley below that must be such an inspiration for his work. Just outside his windows you can see the crumbled, abandoned part of the building which gives it such character. What do you think? Would the color version be more effective? Should I re-do the HDR as a color version? 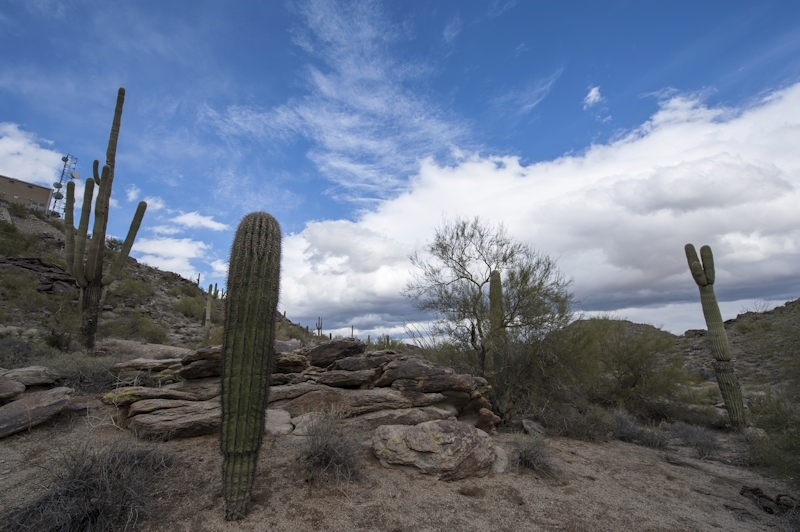 Tonight’s post wraps up my series from our last visit to South Mountain Park. This is another view of the interior of the old abandoned homesite called Scorpion Gulch, located just inside the entrance to the park. Nikon D700, 14-24mm zoom. HDR created from seven bracketed photos processed in Photomatix v4. Post-processing in Topaz Adjust / DeNoise with Paintshop Photo Pro X3. Jerome became a notorious “wild west” town, a hotbed of prostitution, gambling, and vice. On 5 February 1903, the New York Sun proclaimed Jerome to be “the wickedest town in the West”. When the copper played out, the town was all but abandoned. However, in the past twenty years or so, it’s been reborn as an artists’ colony. Many of the old houses and businesses have been turned into galleries and studios. The old hospital has been turned into the Grand Hotel, and that’s where we’ll be staying (the rumor is that it’s haunted!). I’m hoping to get not only some great landscape photography from the vantage point high on the mountain, but I’m also hoping to get some HDR’s of the interior of the hotel. Maybe even shoot a ghost or two! It’s been too many days since I processed an HDR, so I couldn’t resist staying up late tonight to work on this one. It’s been sitting in my computer for several weeks now, and I finally brought it out to play. 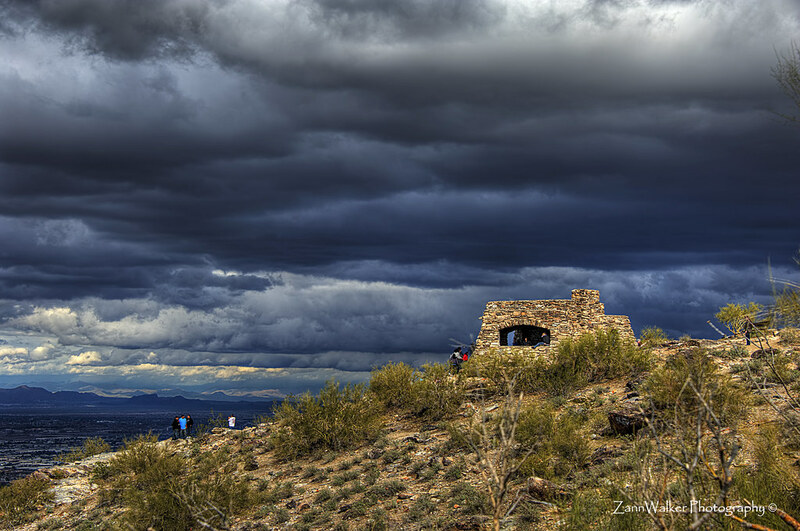 This shot was taken in South Mountain Park in Phoenix, just after a winter storm blew through. The clouds had started to break up, but then they started blowing in from the east again, creating these dark thunderheads over Dobbins Lookout. This is a seven-exposure HDR shot with my Nikon D700 and the 28-300mm zoom. Processed in Photomatix, Paintshop Photo Pro X3, and Topaz DeNoise. Yesterday I grabbed a sandwich for lunch and then drove over to the Gateway Trailhead, a small park on the Thompson Peak Parkway near where I work. After I gobbled down my sandwich, I got down to the real business of why I was visiting the park, and that was to take a few practice shots of the desert scenery. 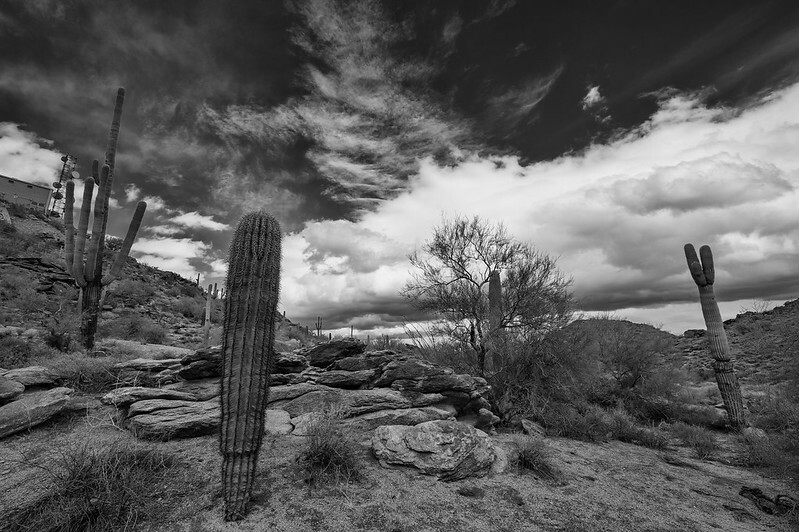 There were some beautiful cloud formations about that time yesterday, so I was hoping that I could find a composition that incorporated both the cacti and the clouds. It turns out that’s a little harder than it sounds when you’re shooting toward the sky on a sunny day, while trying to keep your foreground subject properly exposed. 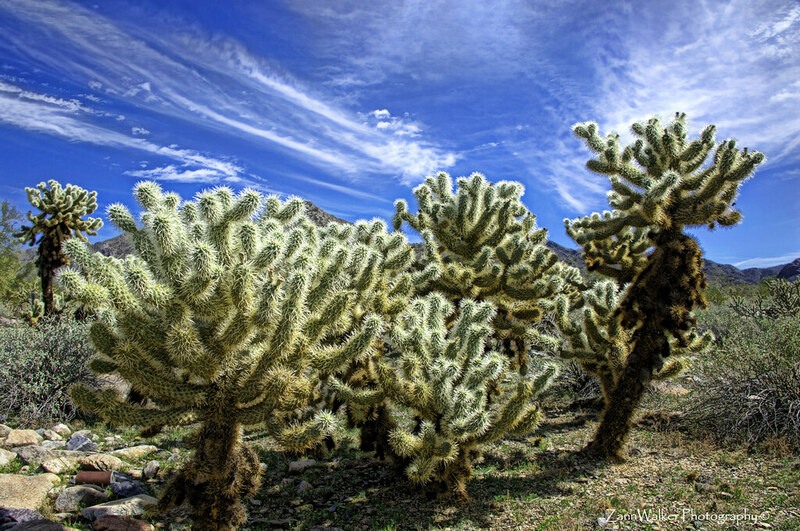 Here’s a case in point–one of my favorite desert cacti is the cholla, sometimes known as the “jumping cactus”. When the sun is just right, the cholla seems to “glow” around the edges from the sunlight captured in the nearly-white spines. In the golden hour, it’s a beautiful thing. In the high-noon sun–not so much. I played around with this one to try and get as much detail back in to the scene as possible, but it’s still a little blown out. I’m posting it anyway, because I think it’s a good lesson for me to remember–don’t shoot the cholla at High Noon (sounds like a Western movie title, doesn’t it?). Oh, and one more lesson–don’t go walking around in the desert in your thin-soled Mootsies Tootsies that you wore to work. The cactus spines will go right through them. Speaking from experience. HDR created from seven bracketed photos processed in Photomatix v4. Post-processing in Topaz Adjust / DeNoise with Paintshop Photo Pro X3. There was a bit of haze that showed up when I used the telephoto, so I took a few liberties with Topaz and PaintShop Photo Pro X3 to selectively sharpen a few things…gives it a little pop on the city skyline. Also, there’s just a bit of snow on the mountaintops in the background. We don’t see that very often here in the Valley of the Sun, so I thought it was really cool to be able to capture it in this shot.